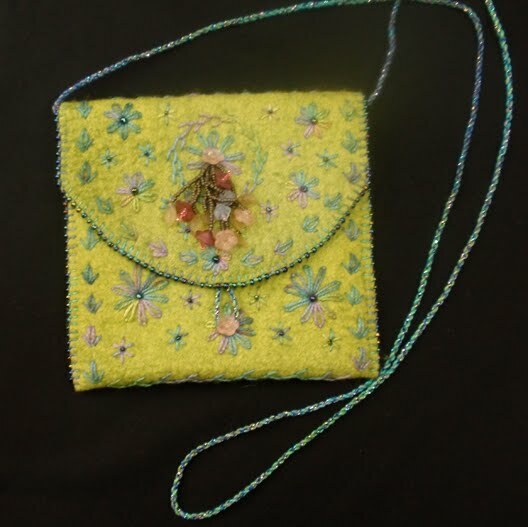 Thought you would like to see one of the bags made at the two & half day workshop I held at Busy Bees in September. In the class we made small felt bags by hand. We used ready made felt for the background with simple to do hand embroidery. They were finished off by embellishing them with buttons and beads. Everyone had a lovely time choosing different coloured felts, threads and beads to make their bags. A few of the women had never done embroidery before but soon learnt a few stitches and were off, enjoying themselves creating their own unique bag. I have seen a few finished bags, and have been thrilled with them. When I get a few more photos I will upload them for you to see. If you have ever made anything at Busy Bees please share the photos of your work with us. We always really love to see them.